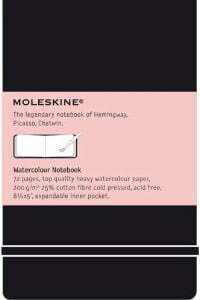 By now most of you know that I love Moleskine products, whatever size and configuration (see Organize Your Patterns). This particular one is great for adding other media to your Zentangle®-inspired art. There are more sizes and orientations (portrait/landscape) of Moleskine Watercolor Journals available to suit all preferences. If you have a Moleskine Watercolor Notebook, please feel free to add your review in the comments below. If you have recommendations for other journals, sketchbooks, or notebooks, please leave your comment on the main page at this link. Check out the other pages under TIPS & TOOLS at the top of the page. There are recommendations if you want to add colored ink to your Zentangle-inspired art, or watercolor, as well as ideas for strings, shading tips, recommendations for related books, and much more to come.